As I’m in Florida this weekend, ahead of Tuesday’s Republican Primary, I am also reading the biography on Dietrich Bonhoeffer, “Bonhoeffer: Pastor, Martyr, Prophet, Spy.” He was a pastor who was executed near the end of the World War II. It is easy to see from history that there are two major errors. First, to withdraw. Withdrawing from the world only allows destructive systems to advance wit hout a Word from God. Second, joining the system. Moving too closely to the system of government easily distorts the unique roles of church and state. And as you look in history, it is always to the ultimate detriment of the church. 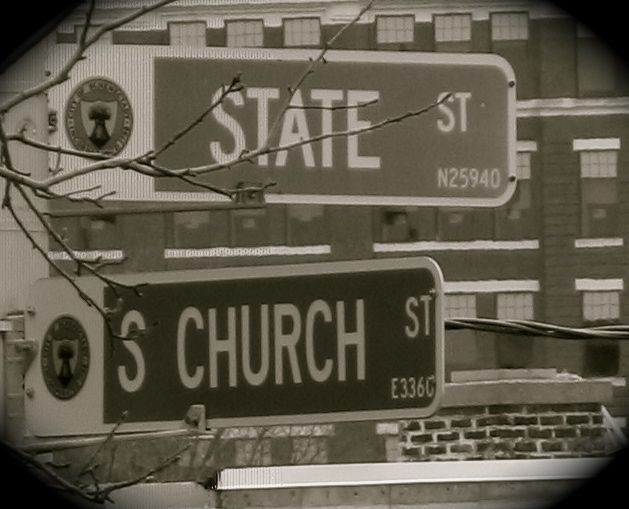 Bonhoeffer wrote of 3 possible ways in which the church can act towards the state. 1) The church can help the state be the state. The state’s job is create an atmosphere of law and order. The church, as citizens, must support that role and responsibility. The church also must speak out and teach on the role of government. And with that, if government is lax or too excessive in it’s carrying out that responsibility, the church must speak and draw attention to the shortcomings, or abuses. 2) The church must aid the victims of state action. When the state ignores a problem of injustice, or creates injustice by its actions, the church must step in and help the affected. For Bonhoeffer, he was marshaling the church to act in defense of the Jews. For Martin Luther King, Jr., he was trying to move the Christians to act in defense of blacks who were systematically shut out of the system. 3) The church should make it hard for the state to step outside of its God-given role. Bonhoeffer wrote, the role of the church “is not just to bandage the victims under the wheel, but to put a spoke in the wheel itself.” He spoke of and acted on this conviction in participating in plans to overthrow Hitler. I certainly don’t think, in America, we are at #3. But for me the bigger question for the Church is, “do we understand our responsibility toward the state?” Do I believe God has a definite role for the state to play and as a leader in the church, am I teaching, leading and persuading the state to act faithfully within that role. Some might wonder, if we live in a pluralistic society, why does the church have a say? Whether or not others in our culture understand our role, we must. They aren’t accountable for us not being faithful, we are. I only have to think of Daniel, willing to speak the truth of God to pagan Kings, and go to the lion’s den for it. Or, John the Baptist, whose head was served on a silver platter for dessert, because he spoke against the King. The state is a servant of God, not the servant of man. And history is littered with despots and political systems that didn’t take their role seriously. Church, we must pray. And we must act. How do you think the Church should act when it comes to it’s relationship with the State? What would these 3 ways of acting look like today? My partner and I stumbled over here from a different web page and thought I should check things out. I like what I see so now i’m following you. Look forward to checking out your web page yet again. this is excellent summary of why the church needs to remember history and speak about it from the pulpits along with God’s Word. if we are so heavenly minded regarding scripture but refuse to learn of the lessons of God’s work among men during our days, we will be condemned to repeat God’s lessons. Bonhoeffers life is an amazing lesson of faith and love of God despite overwhelming circumstances. Thanks Arnie. So true. We need to fulfill our unique role. The church must always see itself as responsible to inform, teach, pray for and even correct the state. But the church can never seek to take over the role of the state. I believe they are separate servants of God. it seems like in the west if God does not intervene, we are about to relearn the lessons of The Confessing church personally. It took 80 to turn full circle again. This is going to come as a very rude awakening to the majority of American Christians and most of all to her pastors who refuse to preach difficult things.